These are not your Momma’s cupcakes! We are going to cheat and use a mix but we are going to dress it up a bit. We are actually going to infuse a cream cheese mixture into the mix after putting it into the baking pan. Now if you insist, make your Red Velvet cake mix from scratch, that will be fine. 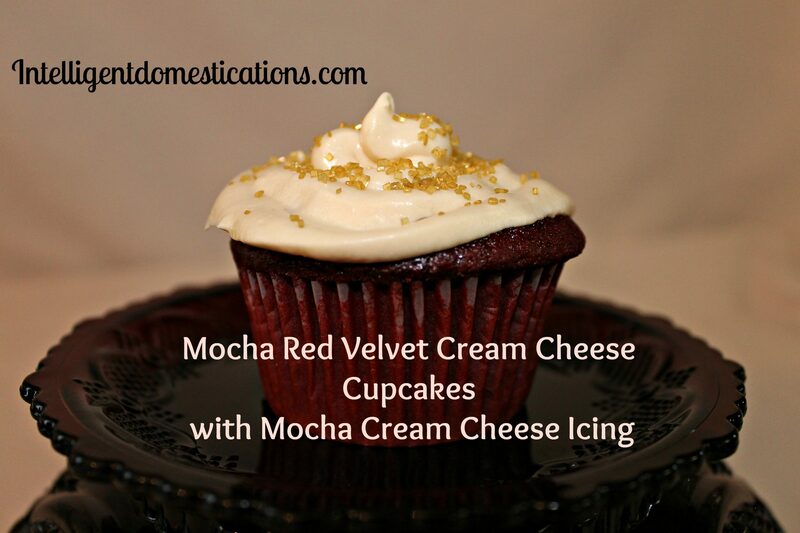 These scrumptious Mocha Red Velvet Cream Cheese Cupcakes are perfect for your Valentine celebration or any occasion when you wish to impress your guests. Follow directions on cake mix box. Add Instant Cappuccino Mix and caramel extract, stir well. Pour into prepared cupcake pan. Hang On…, don’t bake it yet! Make the yummy cream cheese stuffing first! Cream the cream cheese and sugar together. Place a dollop onto the prepared mix in each cup cake prior to baking. Swirl the cream cheese mixture to infuse into the batter. Yes, you will swirl the cream cheese mixture into each cupcake prior to baking. Bake according to cake mix package directions. Cream butter and cream cheese together. Add Instant Cappuccino Mix, extract and ½ box of sugar, mix well. If the icing is too thin, continue to add small amounts of sugar until desired thickness. If icing is too thick add a drop of milk to thin. Ice your cupcakes and serve! I used golden sugar sprinkles on top of mine just to dress them up even more. Your post is my pick of the week at the Over the Moon Link Party. Thank you for sharing your delicious-looking cupcakes with us this week. Wow, I’m so excited Sandy. Thank you so much for picking me, especially when there are so many talented bloggers! I love this recipe because the flavors of the cake are so yummy. 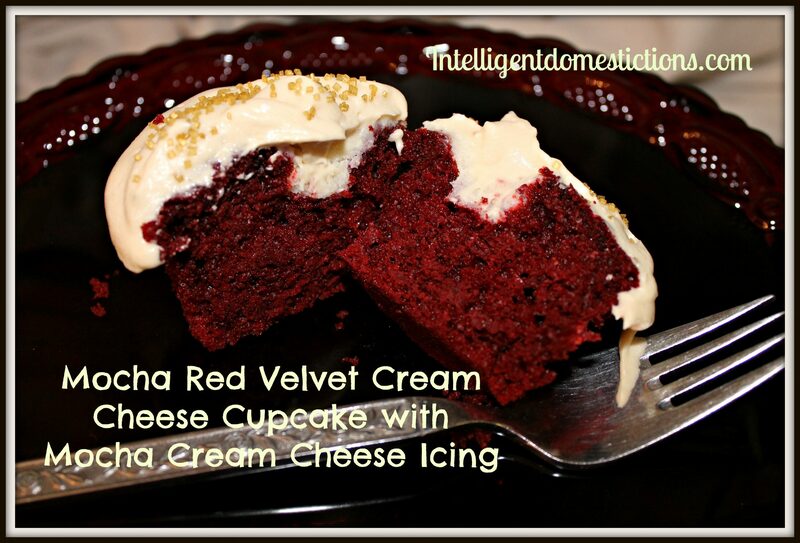 What a great twist on traditional red velvet. Pinned and Tweeted. Thanks for partying with us at Snickerdoodle Sunday, Shirley. Delish! Pinning this. You had me at Red Velvet. Visiting from This Momma’s Meandering Mondays! Thanks for the Pin and thanks for stopping by. These look so good! Thanks for sharing:) Thanks for linking up to the Bloggers Brags Pinterest Party. I have pinned your post to the Bloggers Brags Pinterest Board. Thanks for stopping by. Nice to ‘meet’ you. Bloggers Brag is one of my favorites! Oh my goodness! Those look amazing! And just in time for Valentines Day! I know, right! 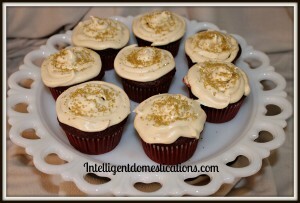 Red Velvet cupcakes do come to mind when thinking of Valentines! Hmm, cream cheese! So yummy! They sure will impress any guests! Thanks for stopping by. Cream cheese is the magic ingredient! These look so good! I want to lick my screen!!! LOL! You crack me up! There were delicious when I made these. Those little gold candy sparkles crunch and I like that too. Be still my red velvet/cream cheese loving heart! These look over the top scrumptious! Me too, Alli. Love cooking with cream cheese for sure, adds a great flavor.